Horror novelist extraordinaire Stephen King’s popularity has resurged these last few years following several high-profile movie adaptations of his most famous novels. Andy Muschietti’s “It” and Mike Flanagan’s “Gerald’s Game” both received critical acclaim, with the former becoming the highest-grossing horror film of all time. To the delight of King fans worldwide, one of the author’s most renowned novels “Pet Sematary” has risen from the dead for a remake of its initial 1989 film adaptation. 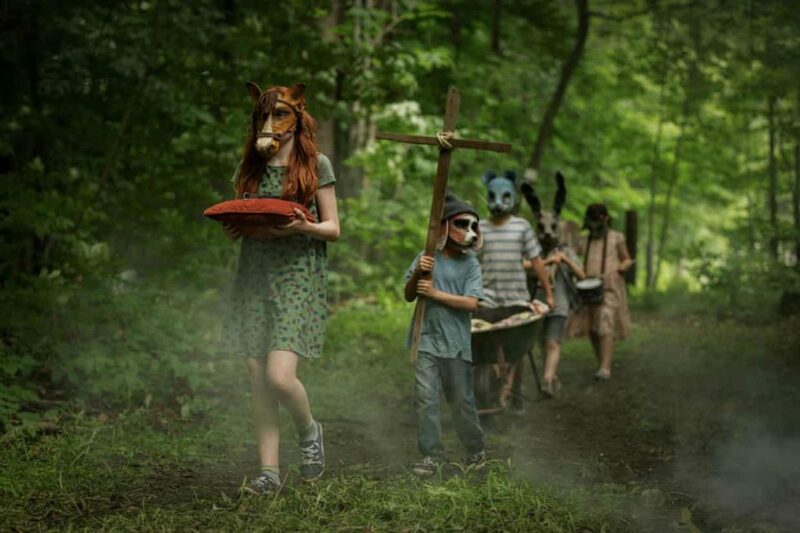 “Pet Sematary” tells the story of Louis Creed (Jason Clarke), a doctor who relocates from Boston to the sleepy rural town of Ludlow, Maine with his wife Rachel (Amy Seimetz) and their children, Ellie (Jeté Laurence) and Gage (Hugo and Lucas Lavoie). Upon their arrival, the family soon discovers a secluded burial ground that appears able to bring the dead back to life — a discovery the family will learn to regret. What’s most praiseworthy about “Pet Sematary” is its ability to consistently subvert modern standards of the horror genre. Whereas most recent horrors would cram their runtimes with as many jump scares as humanly possible, “Pet Sematary” uses its jump scares with restraint, often opting for subtler and even more bone-chilling, moments of dread and absolute discomfort. The film’s dynamic director duo of Kevin Kolsch and Dennis Widmyer draws upon a variety of horror subgenres to keep the audience anticipating the source of the next scare. The film adeptly shifts from psychological horror to the paranormal, and even to some body horror reminiscent of “The Exorcist,” a balance of the different subgenres that work together to produce the high-tension that persists throughout the runtime. The cast especially pulls “Pet Sematary” above the average crop of horror films. Clarke continues to be one of Hollywood’s most undervalued actors, elevating his initially superficial role as the family patriarch, Creed, through an emotionally resonant performance. Creed’s tragic descent becomes wholly convincing. Seimetz, unlike Clarke, was able to enjoy the luxury of working with a well-developed character and wrings out Rachel’s trauma for the audience to confront. John Lithgow brings his trademark charm and gravitas to the family’s neighbor, Jud Crandall, who acts as the gatekeeper to the world of horror. While a lesser actor might have turned Jud into nothing more than a walking-talking expositional mouthpiece, Lithgow turns him into a compelling and empathetic figure with his own grim arc. What ultimately keeps the film from fully coming to life is its script, which focuses too heavily on moving the story along rather than on developing its characters. The film effectively spends much of its first half introducing the audience to its unnerving setting, only to chuck this gradual approach out the window in the third act when it races to the end credits without allowing certain moments and motivations to retain their intended effect. “Pet Sematary” simply neglects to develop its character’s relationships and personalities. This forces the audience to sympathize with the characters almost exclusively through their trauma, rather than through an actual connection and empathy toward the characters’ peril. Though film adaptations should stand alone from their source material — they are, after all, different mediums that require different executions. That being said, those who know and love the original story’s conclusion will likely be disappointed by the film’s conclusion. It’s effective enough as a fun night-out horror film, but, in conversation with the source material, it’s hard not to feel that something was lost in the adaptation process. At its core, “Pet Sematary” is a chilling examination of how a family chooses to deal with its grief. It offers a more refined form of the standard horror film that defined the late 2010s. “Pet Sematary” remains a seminal horror story whose resonant terrors are amplified by its effective directing and outstanding cast. And, to top it all off, it stars a murderous cat.